10:00 - 10:30 -- Registration. 10:30 -- 12:30 -- Workshop: REASON - RagE Against the SOcial Network. (Stephen Marsh, Communications Research Centre, Canada; Audun Jøsang, University of Oslo). 12:30 - 14:00 -- Lunch. 14:00 - 16:00 -- Tutorial: Building Trust in Cloud (Dhiren Patel, NIT Surat, India; Theo Dimitrakos, British Telecommunications Security Futures Practice, UK). 09:30 - 10:00 -- Registration and tea. 10:00 - 11:30 -- Inaugural and keynote 1 (Speaker introduction -- Dhiren Patel). A perspective on the evolution of the international Trust Management research community in the last decade (Theo Dimitrakos). 11:30 - 12:00 -- High tea. 12:00 - 13:00 -- Session 1 (Long papers) -- (Session Chair: Christian Damsgård Jensen). Perturbation based privacy preserving Slope One predictors for collaborative filtering (Anirban Basu, Jaideep Vaidya and Hiroaki Kikuchi). Robustness of Trust Models and Combinations for Handling Unfair Ratings (Lizi Zhang, Siwei Jiang, Jie Zhang and Wee Keong Ng). 13:00 - 14:30 -- Lunch. 14:30 - 15:30 -- Session 2 (Long papers) -- (Session Chair: Audun Jøsang). Incorporating Honeypot for Intrusion Detection in Cloud Infrastructure (Bhavesh Borisaniya, Avi Patel, Dhiren Patel and Hiren Patel). 15:30 - 15:45 -- Tea. 16:15 - 17:15 -- Session 3 (Short papers) -- (Session Chair: Theo Dimitrakos). Rendering unto Caesar the Things that are Caesar’s: Complex Trust Models and Human Understanding (Stephen Marsh, Anirban Basu and Natasha Dwyer). Trust Management Framework for attenuation of Application Layer DDoS Attack in Cloud Computing (Dipen Contractor and Dhiren Patel). An Incentive Mechanism to Promote Honesty in E-marketplaces with Limited Inventory (Yuan Liu, Jie Zhang and Qin Li). 19:00 - 22:00 -- WWCA keynote 2 and banquet at Hotel Taj Gateway. 19:00 - 19:05 -- Welcome (Dhiren Patel). 19:05 - 19:30 -- Cultural programme. Robustness of Trust and Reputation Systems: Does it Matter? (Keynote -- Audun Jøsang). 19:50 -- Keynote followed by dinner. 09:30 - 10:30 -- Session 4 (Long papers) -- (Session Chair: Anirban Basu). Integrating Indicators of Trustworthiness into Reputation-based Trust Models (Sascha Hauke, Florian Volk, Sheikh Mahbub Habib and Max Mühlhäuser). Finding Trusted Publish/Subscribe Trees (Stephen Naicken, Ian Wakeman and Dan Chalmers). 10:40 - 11:20 -- Keynote 3 (Speaker introduction -- Dhiren Patel). Operational Challenges in deploying Trust Management Systems - A practical perspective (Sundeep Oberoi). 11:40 - 12:40 -- Session 5 (Long papers) -- (Session Chair: D C Jinwala). Trust Model for Optimized Cloud Services (P. S. Pawar, M. Rajarajan, S. K. Nair and A. Zisman). Post-Session Authentication (Naveed Ahmed and Christian D. Jensen). 14:30 - 15:30 -- Session 6 (Long papers) -- (Session Chair: Sundeep Oberoi). A Provenance-based Trust Model for Delay Tolerant Networks (Jin-Hee Cho, MoonJeong Chang, Ing-Ray Chen and Ananthram Swami). Trust Transitivity and Conditional Belief Reasoning (Audun Jøsang, Tanja Ažderska and Stephen Marsh). 15:45 - 16:45 -- Session 7 (Short papers) -- (Session Chair: Stephen Marsh). How Events Affect Trust: A Baseline Information Processing Model with Three Extensions (D. Harrison McKnight, Peng Liu and Brian T. Pentland). Improvements over Extended LMAP+: RFID Authentication Protocol (Jitendra Gurubani, Harsh Thakkar and Dhiren Patel). Automated Evaluation of Annotators for Museum Collections using Subjective Logic (Davide Ceolin, Archana Nottamkandath and Wan Fokkink). 09:30 - 10:30 -- Session 8 (Long papers) -- (Session Chair: Christian Damsgård Jensen). An efficient approach for Privacy Preserving distributed K-Means clustering based on Shamir’s secret sharing (Sankita Patel, Sweta Garasia and Devesh Jinwala). From subjective reputation to verifiable experiences - augmenting peer-control mechanisms for open service ecosystems (Sini Ruohomaa, Puneet Kaur and Lea Kutvonen). 10:40 - 11:20 -- Keynote 4 (Speaker introduction -- Dhiren Patel). transCryptFS: A Trusted and Secure File System (Rajat Moona). 11:40 - 12:40 -- Session 9 (Short papers) -- (Session Chair: Audun Jøsang). A New Data Integrity Checking Protocol with Public Verifiability in Cloud Storage (Mihir Gohel and Bhavesh Gohil). Document and Author Promotion Strategies in the Secure Wiki Model (Kasper Lindberg and Christian Damsgaard Jensen). 12:40 - 14:10 -- Lunch. 14:10 - 15:00 -- IFIP TM Executive Meeting in Guesthouse common room. Industry, Government and Trust Management community meet (sponsored by Tata Consultancy Service [TCS] and Centre for Development of Advanced Computing [C-DAC]) in Mumbai at: C-DAC (Erstwhile NCST), Gulmohar Cross Road No. 9, Juhu, Mumbai 400 049. 08:35 - 09:20 -- Flight from Surat to Mumbai and transfer to C-DAC Juhu. 09:45 - 10:30 -- Registration, Breakfast and Tea. 10:30 -- Welcome and opening remarks -- Dhiren Patel (7 minutes). 10:40 -- About CDAC -- Rajat Moona (10 minutes). 10:55 -- Short keynote - Trust Management Challenges and state of the art -- Prof. Audun Jøsang, University of Oslo (20 minutes). 11:20 -- Trust Management Industry Perspective -- Sundeep Oberoi, TCS (10 minutes). 11:30 - 11:45 -- Tea. 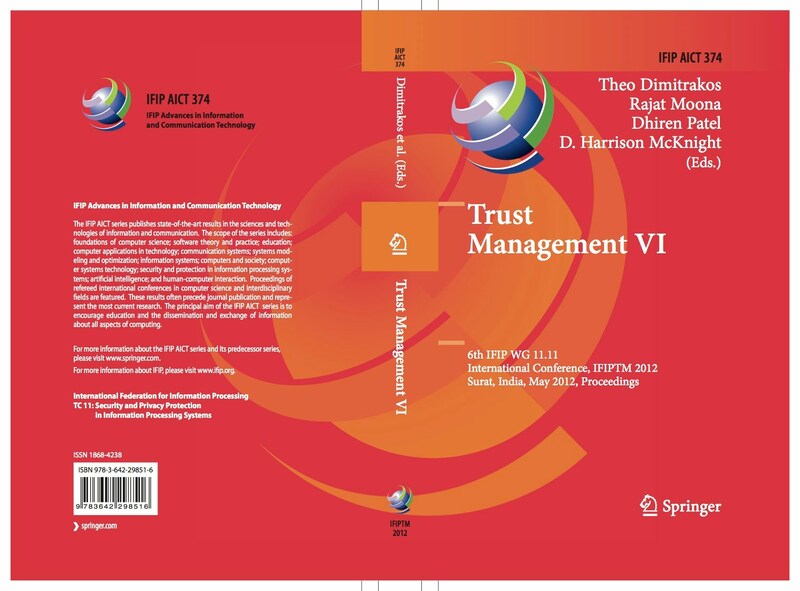 Theme: Trust Management Global Practices - Implementation concerns. Members: Theo Dimitrakos, BT UK; Stephen Marsh, CRC Canada; Rajat Moona, CDAC; Muttukrishnan Rajarajan, City University UK; amongst others. 13:15 - 14:30 -- Networking and lunch. Theme: Trust Management and PKI. Members: Harisson McKnight, MSU USA; Christian Damsgård Jensen, DTU Denmark; Rajanish, IIMA, Vishal, HDFC Bank; Kinchit, UK SIN; amongst others. 20:00 -- Dinner at Emeralds Suites, Juhu Tara Road, Mumbai (Return transfer to airport for IFIPTM2012 delegates is arranged).